Review by AllTheBestFights.com: 2016-11-12, disappointing fight between Luis Ortiz and Malik Scott: it gets two stars. The undefeated former interim Wba champion Luis Ortiz entered this fight with a perfect boxing record of 25-0-0 (22 KOs=88%) and he is ranked as the No.6 heavyweight in the world (currently the #1 in this division is Tyson Fury). In his last two bouts he has won over Bryant Jennings (=Jennings vs Ortiz) and Tony Thompson (=Ortiz vs Thompson). His opponent, Malik Scott, has an official record of 38-2-1 (13 knockouts) but he is not ranked as he hasn’t fought since October 30, 2015 when he defeated Tony Thompson (=Thompson vs Scott). 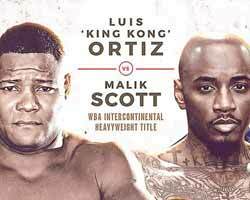 ‘King Kong’ Ortiz vs Scott is valid for the vacant WBA Inter-Continental heavyweight title. Watch the video and rate this fight!